I had been keeping a close eye on the weather all week. 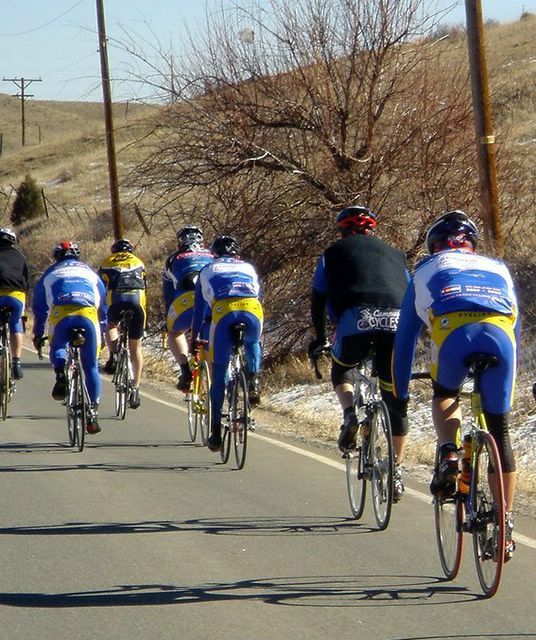 Holding a cycling training camp in the first part of February in Colorado is definitely a hit or miss proposition. The weather was good – mid 40’s and dry. Game on! I arranged to get off work early and headed to Paul and Marietta’s house for the start of our camp. I thought I would easily be the first one there because I made good time on the drive – turns out I was last! The whole group was already there and waiting, with a sense of anticipation in the air. Time to get this thing underway. Our team clothing order (all $22,000 worth) had just arrived earlier in the week. Thanks to the efforts of some teammates, everything was tagged, bagged, and ready for distribution by the time we arrived. It was an extremely cool moment to put on the brand new team kit and roll out onto the road with my new teammates on our way to the first event. The first activity on the schedule was a 3k time trial. To be repeated 3 times. I had waaaay underestimated the difficulty of this event coming into camp. When I first read the itinerary I thought; 3k time trial?? What kind of training camp is that? 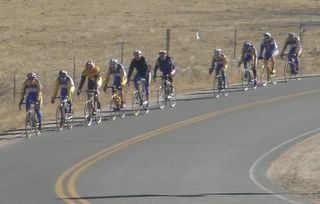 See, my idea of a training camp was doing back-to-back 80 mile rides or something. Boy, was I wrong. Keeping an open mind, as Coach Mike encouraged us to, would be the key to my learning and progress over the next couple of days. I was so confident about being able to produce maximum effort over the distance that I went ALL-out. In fact, it felt like I pushed my body harder than I ever had before. It was seriously 10 minutes after I crossed the line before I knew if I would live or die. I couldn’t breathe! My throat felt like it was torn to shreds (cold air+hard effort=ouch!). Wow, that REALLY hurt. To top things off, I didn’t even get the fastest time. I was 4:22. Hat’s off to Paul, he did a heck of a ride and beat me by 5 or 6 seconds. My attitude and respect for what we were doing was severely adjusted after that first pass. I wised up on the second run and just kept the pace steady, but do-able. I felt quite a bit better, and recovered within 30 seconds or so after the finish. My time? 4:35, only 12 seconds slower than my first attempt. Cycling is amazing to me in that respect. The effort required to make the difference of a few measley seconds… Score another one for Paul. What’s up with that!?!? Paul (president of our club) is an excellent, very experienced rider that I have a lot of respect for. But – he’s known more for his climbing abilities. Not that I’m the greatest, but hammering along the open road is more my territory. I expected to really turn it on and lay some waste to the competition (I surprise myself with how cocky I can be sometimes…). That’s one thing about racing; it’ll humble you for sure. The third try – fugeddaboutit. Chris’ legs have left the building… 5:00 flat. My HR average was 164. What?!? 164 in a time trial? I could do that with one leg on most days, this time I was shot. Still not recovered from the previous week’s training. It was getting late in the day and colder with every passing minute. I was shivering hard before the last attempt and just couldn’t turn the pedals. Paul? 4:44. He gave me a good thrashing today. We’re doing hill repeats tomorrow, looks like I’ll have my work cut out for me. We shivered our way back to basecamp. I could hardly ride a straight line. Man, was I glad to get inside. What awaited us was a gormet feast prepared by Marietta from recipies in Chris Carmichael’s latest book. VERY good food! Mixed green salad, tomato florentine soup, and stuffed flank steak! Now that’s ‘camping’. We also reviewed our positions after the day’s three time trials. I’m sitting in second place right now, about half a minute behind Paul. With 3 repeats on Lookout Mountain tomorrow, it’ll be interesting to see how we’ve recovered from this first round.